Palomar’s laser technology is the perfect choice for the treatment of wrinkles, acne and surgical scars, pigmentation, stretch marks, unwanted hair, crow’s feet, vascular lesions, skin tightening and more, on virtually any trouble spot on the body – face, neck, chest, arms, and legs. With light-based permanent hair reduction, just a few simple treatments is all it takes to permanently minimize hair growth, revealing clear, silky skin that’s ready to bare every day-and all year long. Best of all, treatment sessions take just minutes and are practically pain free. It’s the hair removal solution you’ve been waiting for. 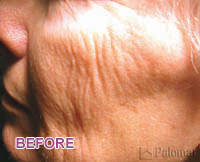 Palomar's laser technology is one of the world1s most advanced cosmetic and aesthetic laser systems.